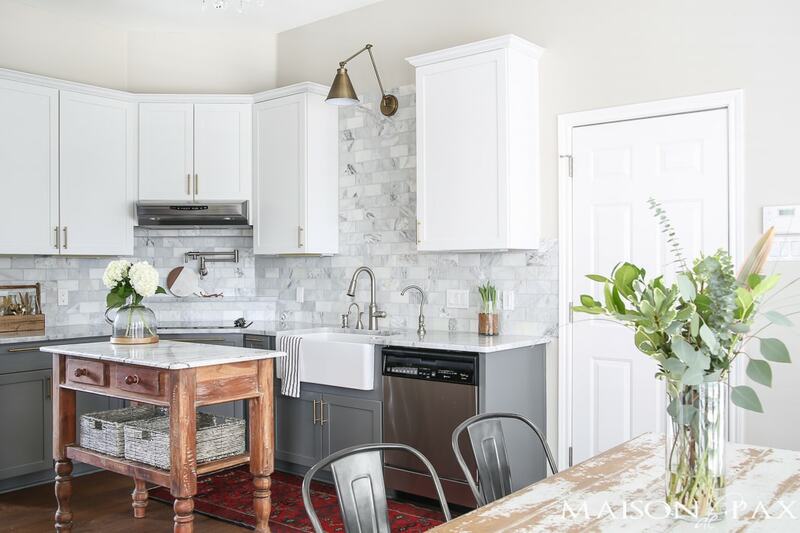 Two-toned gray and white cabinets, marble subway tile, Carrara countertops, a big farmhouse sink, and brass hardware give this gray and white and marble kitchen a classic yet modern look. A special thanks to Wayfair and Moen for providing products for this space! As a mom of three littles ones who recently celebrated Christmas, trust me when I say that I know the meaning of anticipation. They would have counted down the seconds to the big day starting in October if they could have counted that high! And while I rolled my eyes at least a million times at the question, “How many more days until…”, I have to honestly confess that I kind of feel the same way about today. A year after I first mentioned on the blog that we were forming kitchen renovation plans, I have a full reveal for you! You may have seen it spruced up for Christmas or shared from time to time on my Instagram feed (and I’d love for you to follow along here if you don’t already! ), but today I’m spilling all the details: sources, victories, setbacks, and more. Note: all sources are listed at the bottom of the post! It all started when I was about 5 years old…. But my mom knew exactly what she wanted: light, bright, and lots of pretty marble. So my dad and grandfather took a trip down to Mexico and loaded a pick up with tons and tons of 4″x8″ gray and white marble tile. A few months later, my mom had an all-white kitchen with marble floors, counters, and backsplash. Do you think it’s hereditary? 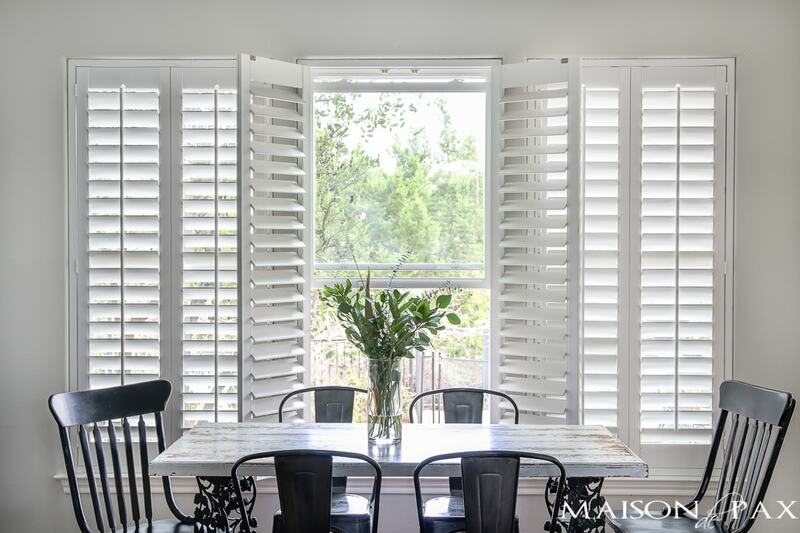 But seriously, I adore my mother’s classic style, and I think it fits perfectly in our fairly traditional home in the Texas hill country (you can tour the rest of our home here). When we bought the home, it had a very yellowy cream and brown vibe, with lots of faux Tuscan accents. Not only is that not really my style, I don’t feel it was true to the home’s architecture. Thankfully, the previous owners took great care and used high quality materials, so we had a good base to start with. The kitchen, though, felt especially dark with the brown cabinets and indirect sunlight. Gray and white is much more my style. We also found the marble tile at an amazingly affordable price, which certainly helped us make the decision. The two completely new elements for me (you’ve got to give me credit for a little originality, mkay? 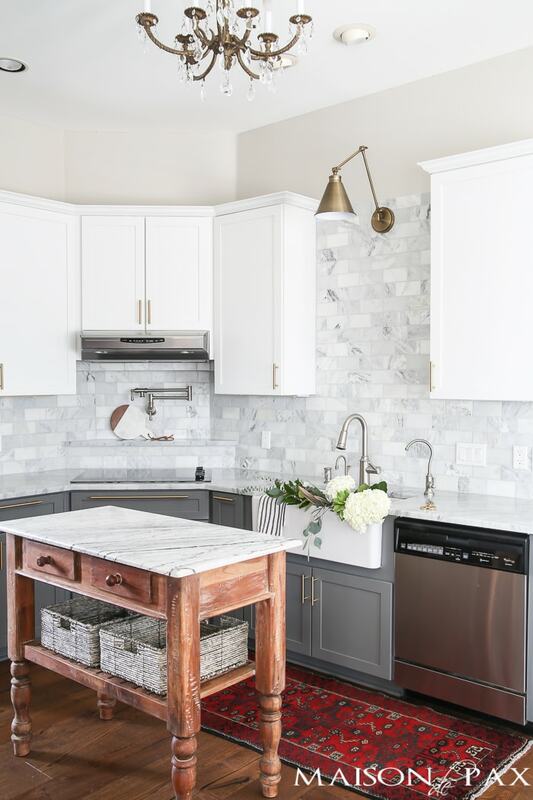 😉 ) are the two-toned cabinets and the gorgeous white farmhouse sink that was generously provided by Wayfair. Oh, and the brass hardware. Speaking of the brass, I’m especially smitten with the new light above my sink (also from Wayfair). Between the snazzy light, the big beautiful sink, and my new faucets (generously provided by Moen), it almost makes washing dishes actually enjoyable… Almost. 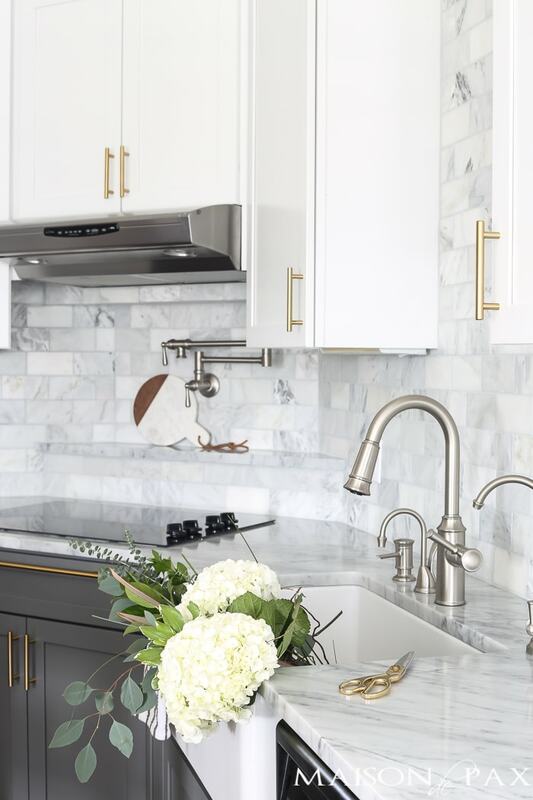 The giant, single basin sink really is so incredibly easy to use, though, and I think the Glenshire pull down faucet and the Sip traditional beverage faucet (both from Moen) are the perfect blend of modern and traditional for the space. I love how the lower access to the apron front sink allows my kids to reach it more easily but the deep bowl keeps messes, dirty dishes, and water spray well-contained. This is my first apron front sink and my first single basin (expect for a one-year rental almost 15 years ago! ), so it was a bit of a gamble on my part. But I can honestly say that I don’t ever want to go back. I. love. it. 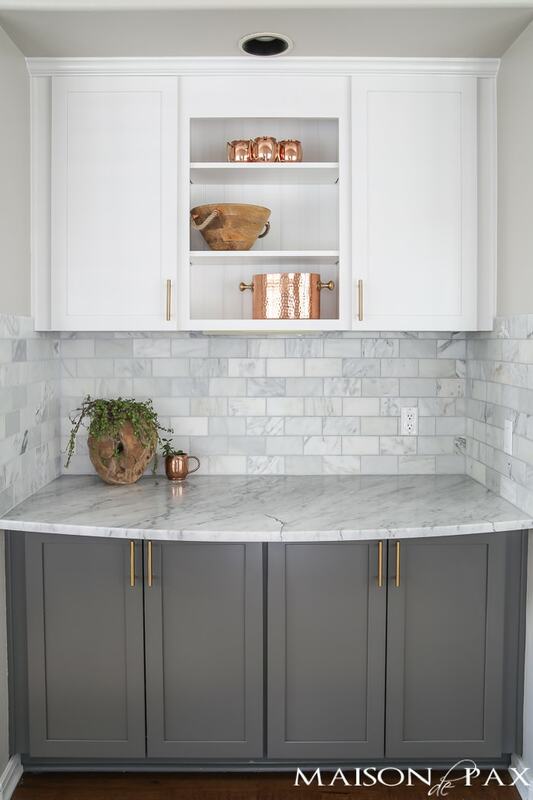 I really wanted a little modern flair in this space, and I decided gold cabinet hardware and light fixtures were the best places to do that. Since I already had this antique brass chandelier (it was hanging in the master bedroom of the first home we ever bought, and I have taken it with me each time we’ve moved! ), using brass accents also allowed me to bring in some of that vintage elegance I love so much. 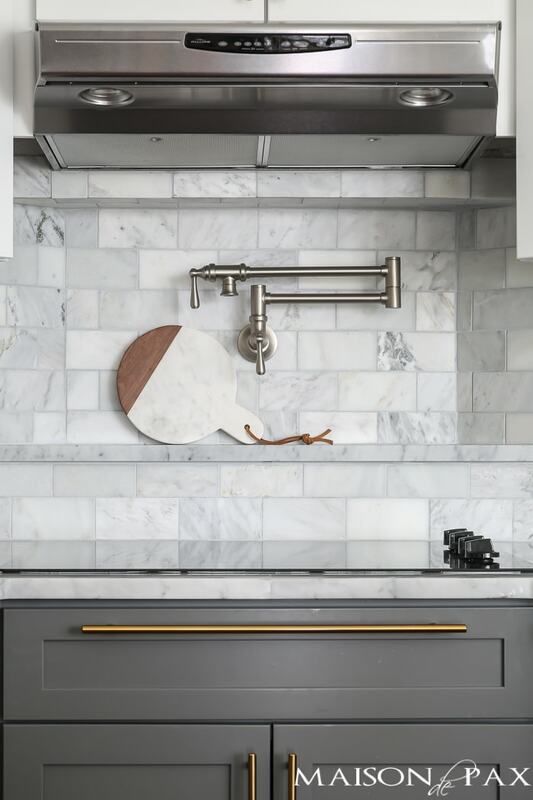 The brass sconce was then an easy choice for a modern touch and centerpiece for our marble tile wall. The cabinet pulls took some time-intensive research. I shared some of my favorite ones a few months ago (seriously, there are some really great ones out there), but once I brought home some options to hold up in my space, these were a no brainer. They were solid and substantial, yet much more affordable than lots of the brass/gold options I had found; they had the same hues as the lights I had already chosen; they were available on Amazon, and they even came in these amazing long lengths at reasonable prices (I’ve seen long bars like this for upwards of $60… $11 is such a bargain!). I just wish we had more long drawers to use them on! I love bringing in accents like hardware in a bold color because it’s not a terribly expensive fix later if something goes out of style or a future buyer is not a fan, especially if you choose handles that have a standard width. I did, however, choose to keep our faucets in stainless for the same reason: replacing faucets is much more expensive and time-consuming. Our appliances were all stainless anyway, and I actually really like the look of mixed metals. Speaking of our faucets, I splurged a bit and added this gorgeous Traditional pot filler from Moen to the kitchen. Is it necessary? Absolutely not. Especially since our sink is a few mere steps from our stove. But do I use it all the time? Yes! It’s so much easier to fill a big pot for pasta right there on the stove. And I definitely prefer using it to top off an already warm pan rather than moving a hot pan to the sink and back. Plus, I think it’s a beautiful centerpiece for our little nook above the stove. We were originally planning to simply paint the maple cabinets, but you observant folks have probably already noticed that we ended up replacing our more elaborate decorative doors with simply shaker style fronts. That was a total lucky breakthrough. We happened upon a huge Kraftmaid sale just before our kitchen renovation was scheduled to start, and the installed kitchen cabinetry happened to be Kraftmaid. Since paying a professional to paint kitchen cabinets the right way is simply not cheap (and I was not interested in doing it myself again this time), a huge sale on doors that actually fit our cabinets was such a blessing! For not much more than we were going to pay to have it all painted, we were basically able to simply reface our cabinets: they painted the frames, and we were able to install factory-painted (which are much more durable) doors in a style I prefer that fit our cabinets perfectly. We went with Dove White on the top and Greyloft on the bottom and simply paint matched each for the cabinet frames. I knew I wanted this look of white above and a medium to dark gray below ever since I made over our half bath (the very first room I tackled in this house! ), and I couldn’t be happier with how it ended up. We carried all the same materials around the corner to our bar area, as well. And allows the simplicity of the breakfast area and our view to the outdoor dining space really shine. Below is a full source list as well as shop-able images for you visual friends. It turned out so beautifully, Rachel! I’m sure you’re thrilled! Hope you’re having a wonderful week, friend! Your kitchen remodel came out amazing! I love the combination of the light and dark cabinets and would love to do the same in my own. But we have a tall pantry cabinet and refrigerator surround that connect them, so there is no clear transition for the color change. At any rate, I do also really love the cabinet hardware you’ve used. Can you tell me what size you’ve used on the cabinet doors? I currently have knobs on the doors, and this would be quite an easy upgrade to my existing cabinets! Thanks for sharing your sources! You are so kind, Karen! Thank you. 🙂 We used the ones marked 4″ on the cabinet doors, but that refers to the distance of the drilled holes; the handles are actually closer to 5″ if I remember right. I hope this helps! This is breathtaking!! What an incredible vision and design. I love all of these elements together. 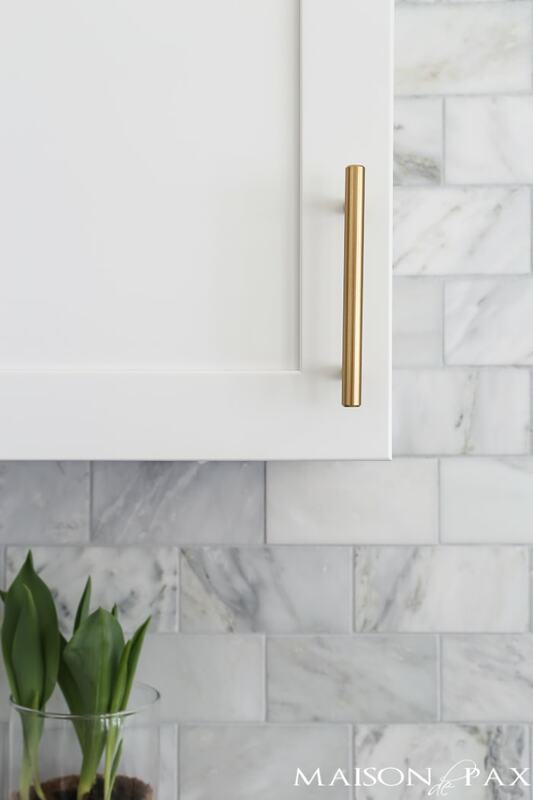 And those cabinet pulls – perfect! Oh Meredith, you are so kind. Thank you! Looks fabulous and i know you now enjoy being in such a great place. It is just luvly Rachel. Hmmm, o like the brass with the grey. That surprised me. I love it! The two tone cabinets are so pretty with the marble and like the old style lighting…wondering why that chandelier is up so high? I love chandeliers in the kitchen and have seen a lot of photos, usually they are down a bit. Love your table too, really unique and gorgeous. Your kitchen is marvelous! It looks as though it was done by a professional kitchen designer…which I consider you to be. 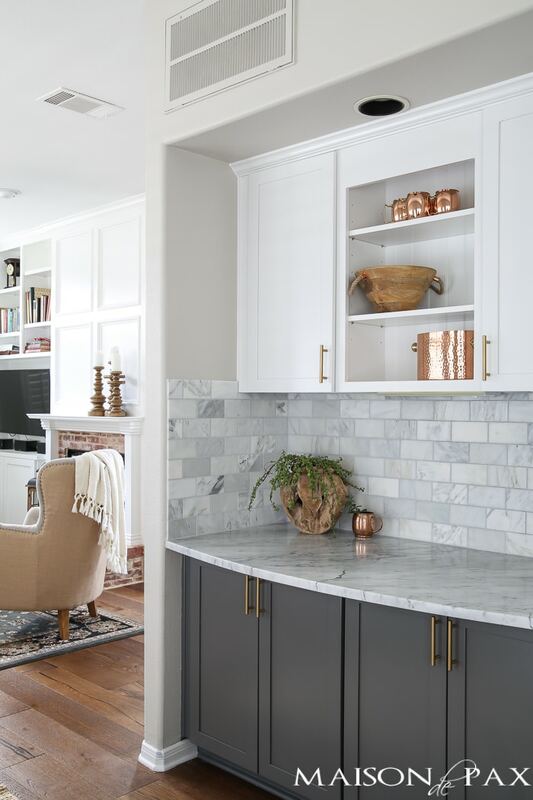 The gray and white mixed with the brass is amazing together, and the marble is the icing on the cake. This was such a treat to see, TFS. You are so so sweet, Juanita! Thank you so much! Lovely, Rachel! I especially like the apron sink. I have a large single sink in my Wee Abode, and I was just telling my interior-designer cousin that I hope I never have to go back to a double sink. I really love it! Love the colors you chose, as well. You were ‘true’ to yourself! Sounds like the Lord blessed you abundantly by making this affordable! He is so kind in so many ways! You did a fabulous job, it’s just gorgeous. Your kitchen is beautiful!! I’m curious to know how much space allowance you have around the island table? I’d really love one of our kitchen, but not sure we have space. Thank you so much, Fran! Great question. Honestly, it’s a little tighter than I would like, but it is definitely do-able… We work with what we have, right? 😉 The tightest spot is 34″ from the island to the sink/dishwasher. The other side (by the fridge) is 36″, and the end to the stove is a full 44″. Hope this helps! Absolutely amazing, friend!! And yes, you did your childhood roots justice and then some! You are such a doll, Jamie. Thank you! 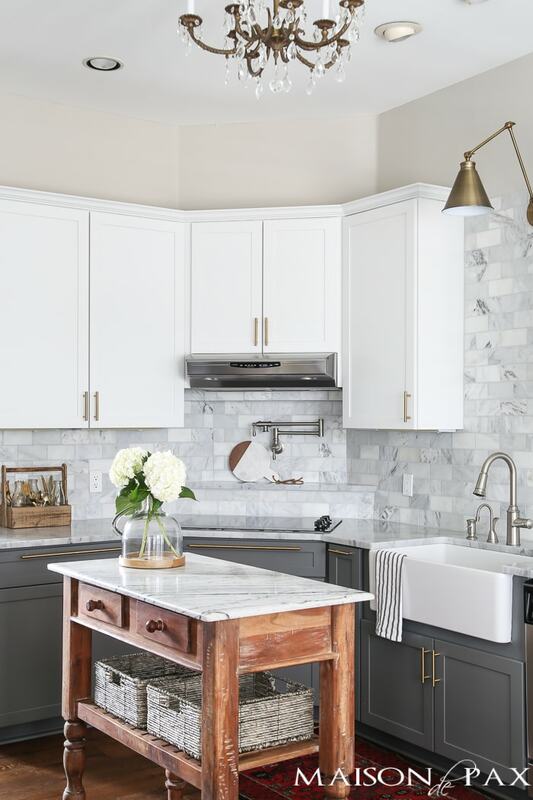 This is so lovely, and I’ve bookmarked it for our upcoming kitchen reno inspiration board; we have a 1903 San Francisco home, and the neutral palette with traditional and modern mix would be a dream in the space. Love that you went for carrera marble countertops; any advice on maintaining and preserving them through kitchen wear/tear? You did a lovely job in this kitchen. Everything flows so beautifully. Well done! Thank you, Becky. You are so kind! Your kitchen is absolutely beautiful. Congratulations to you and your mother. This looks just stunning! If I were I’d be grinning like a fool every time I walked into my kitchen. And seriously, I didn’t even know a pot filler was a thing – that is so cool! Haha… I love it, too. Thank you so much, Kelly! 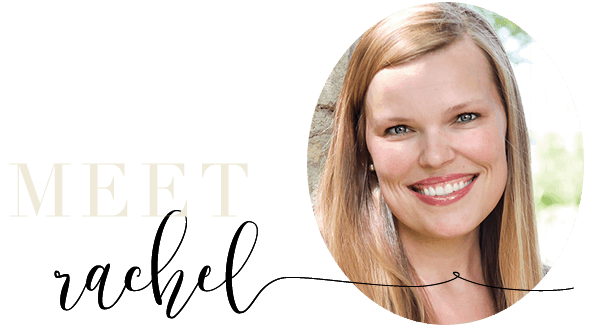 Rachel, I absolutely love your style and your kitchen is gorgeous! So happy for you! My kitchen is the same color scheme but I didn’t have the guts to use gold hardware although I do love the way it looks. I may switch that out now that I have seen yours ;-). This is beautiful! You did a wonderful job of combining classic and modern, with a touch of vintage, and the space look so personal and lovely. For your cabinet frames, may I ask if you have a paint match for the Kraftmaid Dove White? We’re currently ordering Kraftmaid Dove White cabinets for our new build, and will likely add a soffit & crown molding above, so will need paint to match. Apparently Kraftmaid sells the Dove White paint by the quart – is that what you used? Thank you so much, Kimberly! We actually simply took our cabinet doors to Sherwin Williams to have it paint matched there. I’m not sure if this is accurate, but I was told that the paint Kraftmaid sells only works with raw wood, and as our cabinets were already finished, I went with a good primer and a color match from SW instead. The store near us was able to match the White Dove right away; the Greyloft took a second try to get it spot on, but they really did in the end. I hope this helps! This is inspirational! I want those exact cabinets and hardware, thanks so much! I have a question about painting your cabinets… did you have to take them off the wall and paint the insides? I’m new at homeownership and would love some tips on how I can keep costs low and love the painting idea but am not sure I am crafty enough to make it look professional. Thanks! I’m so glad you like it! You do not have to remove the cabinets from the walls to paint them, just the doors, and we did not even paint the insides (as they were already in good shape). Young House Love has an excellent tutorial on painting kitchen cabinets if you want to DIY it; just google it. 🙂 I hope this helps! Hey! Amazing kitchen! 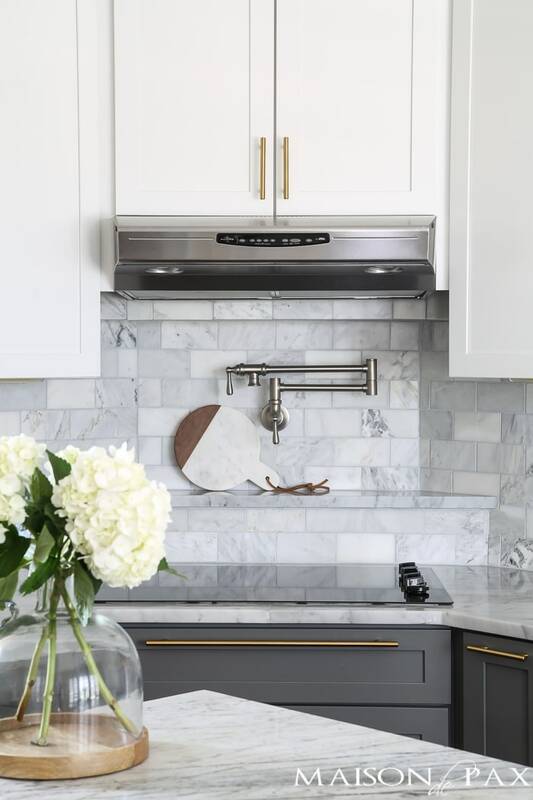 Love the backsplash and noticed that each tile differs somewhat in color and design, when you ordered did they send it with that variation or did you use multiple kinds of tile and put it together like that? Thanks!! Thank you! Since it’s natural stone, the variations were all there. My tile guy made a point of mixing the grayer and whiter ones up so the variation would show more. Hope this helps! Which honed Carrara Marble type is this? There are many versions like Bianco, white, venato, etc. they all look so similar online do you recall which one yours was? Thank you! Looks so beautiful. I’m afraid it was the only one they had in our store, so I don’t remember… but I think it was labeled “white” if anything. I would encourage you to try to pick your tiles in store, if possible, though. With these (as with all natural stone) there is so much possibility of variations. I found plenty of boxes with the white/gray veins, but there were also lots of boxes with more cream tones or simply more white tiles with less veining. Choosing in person allows you to go for the look you love. I hope this helps! Your kitchen is absolutely beautiful. I am also going with a remodel of my kitchen with a gray and white color scheme. I am replacing my old range hood as well. Can you tell me what model you used? I really like the one you hung over the pot faucet. Thank you! The hood was actually there before we remodeled, but it is an Allure by Broan. I am not positive of the model, but I think it is this one. I hope this helps! Hi Rachel! I’m in the middle of a kitchen renovation, and I absolutely love yours. I am on the brass hardware hunt right now… and definitely looking for good prices. When I click the link for the brass pulls, it doesn’t seem to work. Did you get the “amber gold” pulls off of Amazon? If so, then I’ll probably do the same! I wasn’t sure if they would still be considered brass. If not, could you email me the link? Thank you! goes well. 🙂 Yes, sorry for the confusion, I used the amber gold ones from Amazon. I hope this helps! Love your kitchen! Obsessed with your demijohn!! Did you purchase it recently? Does it have a brand name? Thanks! Hey, Rachel! I absolutely love your kitchen, it’s stunning. I’m trying to decide on whether to go with carrara marble for my kitchen countertops. I’ve looked into quartz alternatives and they aren’t near as pretty in my opinion and more expensive. I love the look of the marble but I’m concerned with how it will hold up with daily use. 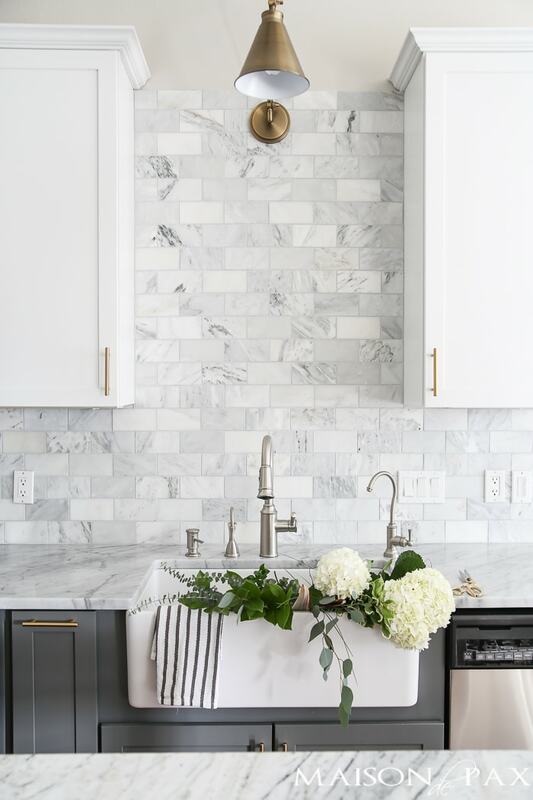 I would love to hear your thoughts on living with marble countertops….so any insight you can give will be appreciated! Thank you! You are so sweet, Kaci. Thank you! I felt the same way… All I can say is that if you are a perfectionist, it might not be the right choice for you. But if you like age and patina, I think it’s great. We have only had our counters for about 6 months, and there are some scratches and dings, but nothing major. If you use a good sealer (which is basically a necessity), then stains shouldn’t be an issue. I am hoping to put together a full review post of our counters (including close up pics of the scratches we have gotten so far), but it just hasn’t happened yet. Sorry about that! Just like you’ve been hearing, what a dream kitchen! I too want to hear more about your brave choice to go with Carrara marble, especially when you have three kids! 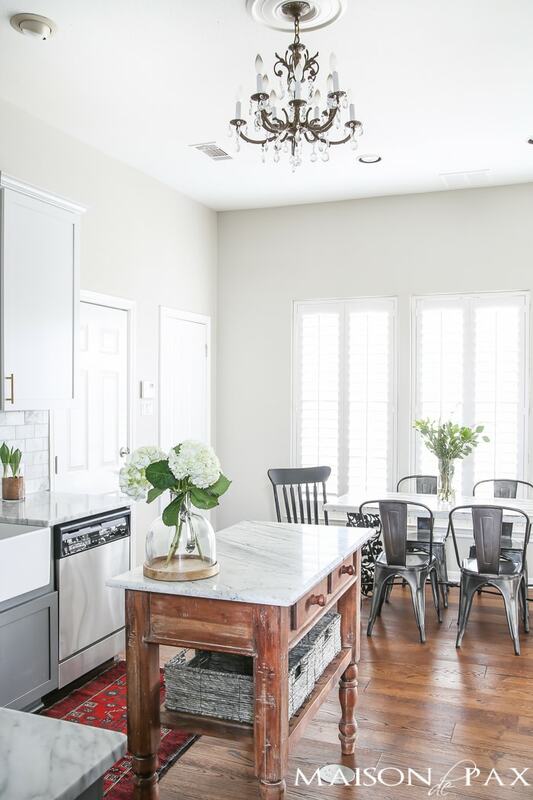 It’s my absolute favorite look and I would love to go for it with our kitchen renovation, but my husband will kill me if I choose something that gets wrecked easily by spills. I have a 2 year-old and hopefully another on the way soon and I’m pretty accident-prone myself. We make smoothies with berries daily and I wonder how the Carrara holds up to dark color spills/ splatters and citrus acid. Would love to get an encouraging green light to go for it, but nervous about it. Thanks for your insights! Gorgeous, gorgeous, gorgeous kitchen, btw. Love the pot filler, the lighting, the pulls, the whole thing! Thank you SO much! I keep thinking I’m going to write that post about our counters, but it simply hasn’t happened yet… So here’s the skinny: I love it. I haven’t had a single stain or even fear of one (and we eat tomatoes, use lots of lime juice, and my husband seems to have a knack for splattering coffee everywhere). The sealer my installers recommended seems to do the job of protecting from stains VERY well. Etching and scratching is another matter. It doesn’t bother me, but they’re there if you look closely. It might stress some people out, especially if the light strikes your kitchen in a certain way. While we have lots of windows in the breakfast area, we don’t actually have any in our kitchen, so it’s not a matter of the light highlighting them. I once caught my son using a knife to saw the edge (and yes, I flipped), but even those little marks have just blended in. I can find them, but no one else can. It doesn’t look exactly the same as the day it was installed, but none of the spots catch anyone’s eye but mine. I hope this helps a bit! Your kitchen is beautiful! What thickness of spacer did you use for the tile backsplash… is it 1/16 or 1/8? Thank you! Thank you so much! We used a 1/8 spacer. Hope this helps! They are the manufacturer’s paint colors for the cabinets. What’s your best guess on a close gray? We don’t have kraftmade cabinets so I’ll have to repaint my own. Your color scheme came out absolutely gorgeous and I simply cannot find one that I like better! Even if you have the old color-matched paintcan, we could get it re-made using the formula they put on the sticker. I would be forever grateful! I don’t have the paint can, but I did see a few comments on Pinterest for Behr Pencil Point. Maybe start there? Thanks for stopping by! Beautiful kitchen!! Love the backsplash!! Went to Floor & Decor to see the honed marble in person. But it looks so different from yours. I see more veining in yours. Did you hand select pieces? Any help would be greatly appreciated. Thank you, Cindy! That is the tough thing about natural stone: each piece can vary greatly. It will depend on the source and lot of that particular set of marble. When we purchased ours, there were some boxes that had more creams and yellows mixed in and some that were more gray. I went through and chose only the boxes with significant amounts of gray. If you’re not finding what you want, you might ask them when the next shipment is coming in and see if it brings something a little different. I hope this helps! Beautiful. What finish (sheen?) did you use for you cabinets? Thank you so much! I actually don’t remember. 😬 I don’t think there was an option from Kraftmaid (it’s sort of a satin/semigloss, I think), and we just had the paint matched as closely as possible for the frames. I hope this helps! Your kitchen is so beautiful! I love your backsplash. 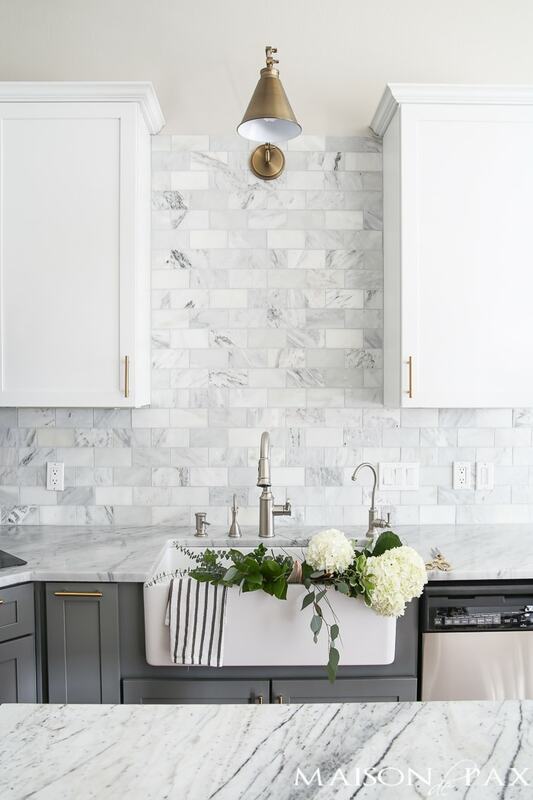 I looked for the same Carrara Marble tiles online, but they look white-gray on the pictures. Yours seem to have cream and purple in it as well. I don’t know if its just the picture or is this honed marble tile supposed to have some other color tones in it as well? I love the way yours looks! I think it could be the picture, mine is a soft honed gray and white. As always, you might want to order a sample to see if you like the look in person. Hardwood Floors look great. I like the island too. Everything looks so clean. Your remodel looks amazing! 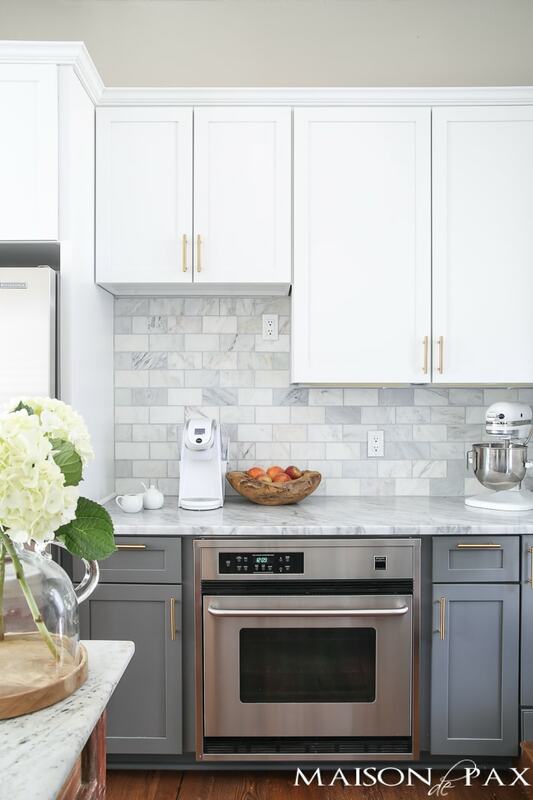 I love the gray and white marble with the white shaker cabinets + modern accents. And when you tie these in with the unique island… it has it’s own unique personality. BRAVO!!! What size are your pulls? I hope to order mine soon but need some sort of reference for sizing! thanks! Thank you! Ours are the 4″ pulls (which means the holes are 4″ apart; the handle is closer to 5.5″). Hope this helps! Your kitchen is now my new inspiration for our kitchen remodel. I love your red rug! It adds a fun pop of color to the neutrals in your kitchen. Where did you get it? And is it washable? Good for kitchen usage? Thank you so much! I ordered it from Ebay, and it’s a vintage wool persian rug. It cost ~$70, and the dark colors (and real wool) make it very forgiving. I don’t get it wet very often, but the splashes here and there haven’t hurt it. Any real dirt that the vacuum hasn’t picked up usually comes right up with a wet dish towel. I hope this helps! So glad it was helpful. I hope you can find the perfect fit soon! Gorgeous! I have been searching for marble tile like this, I see where you sourced it and we have Floor & Decor near us, so yay! Just want to clarify, if possible…there are two honed Carrara marble tiles. 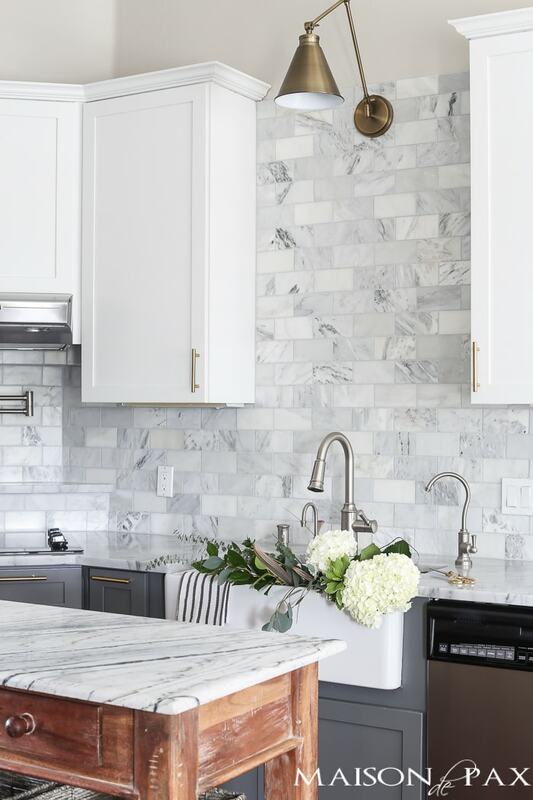 Do you remember which of these you went with: Casa Antica Ocean Honed Marble Tile OR Carrara Marble Carrara White Honed Marble Tile. Thanks so much for your help! I’m so glad you like it! Unfortunately, they only had one option at my store at the time, so I’m not positive… but I’m pretty sure it was just called Carrara White, not Casa Antica Ocean. I hope you’re able to find some great stones! Love your kitchen remodel. I noticed that the wall cabinet to the left of your cooktop is not the same as the before picture. The before shows two cabinets, and the after shows one. 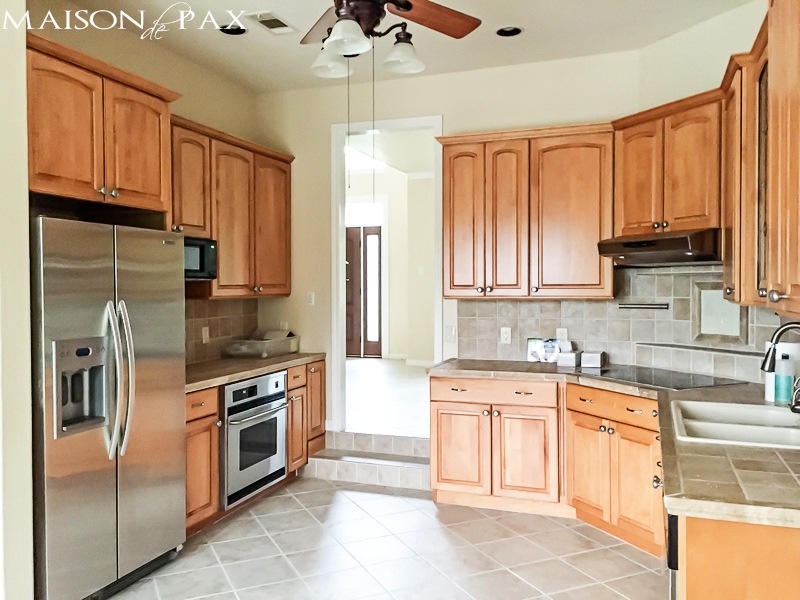 Did you replace those cabinets, or just use bigger doors to make it look like one big cabinet? It was actually a single cabinet with two small doors that met in the middle to close it (does that make sense?). The cabinet is not subdivided and we wanted a simpler look, so we simply opted to replace it with one door when we remodeled. Hope this helps! I just bought that exact tile at Floor and Decor! Did you seal it? And if so, what product did you use? Thank you! Wonderful! I did wipe on a layer of sealer when I sealed my countertops. You can read all about the process and the sealer I used here. I hope this helps! Beautiful! How did you modify the sink cabinet for the farmhouse sink? Did you replace the cabinet entirely? Hi Kelly! Yes- they are all new cabinets from Kraftmaid. Hope that helps. What is your trim color please? The white cabinets are KraftMaid’s Dove White, but the baseboards and windows are doors Sherwin Williams Extra White (straight off the shelf). I hope this helps! Such a beautiful space! I am actually about to do a marble subway tile backsplash with platinum grout, as well! Do you remember what mortar you used? Also, were the marble tiles difficult to cut? I read that marble is soft and breaks easily. Thanks! Thank you so much! Unfortunately, I outsourced the tile in the kitchen, so I’m afraid I don’t have those answers for you… so sorry! Good luck with your renovation, though!! Just stumbling across this on Pinterest! I am very curious about your hardware. I too am looking at long brass pulls for big drawers. I was looking at Lewis Dolin brass, but they are so much more expensive. Have yours held up? Do they look similar to a satin brass? Also what size did you use on your bottom cabinet doors and did you use any for an appliance pull and would you recommend it? I have heard one reason to get special appliance pulls is the extra space for grip but these seem to have a good amount of space under them. I did a lot of comparison when I bought these (ordered one of lots of things, including the Lewis Dolin), and I honestly liked these the best. It made it even better that they were about half the price of the others! They seem very sturdy and a nice, warm brass color (the Lewis Dolin are really more gold than brass, in my opinion). You could always just order one and see if you like it. The long ones we ordered are ~18″, and they seem very sturdy, as well. I’m not sure if they would work as appliance pulls or not, but they seem to be plenty strong to me. I liked them all so much that I put them in our recent bathroom renovation, as well. I hope this helps! I honestly love them, but if you want something more ‘tarnished’ or vintage, these might be too modern. Your kitchen is gorgeous and I have gone back and forth on marble and I’m finally going to follow my heart and get the marble. Everyone keeps telling me no, but I just love it. 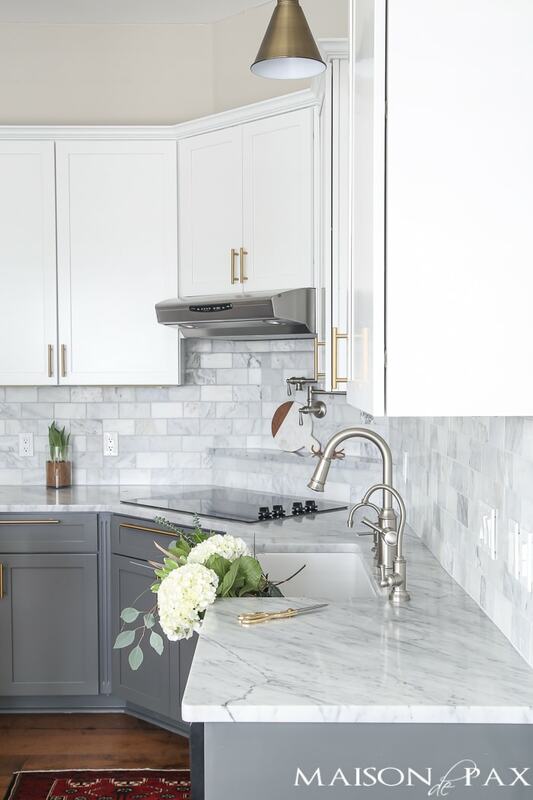 Regarding the faucet…I see the large faucet and the small beverage faucet by Moen but there seems to be a third taller slender faucet off to the right of the sink in the picture?? Is that a hot water tap? If so is that also Moen and what model? I love the faucet and also need a hot water faucet. The little beverage faucet you linked seems to only be for cold water. Could you tell me what the other faucet is? Thank you! 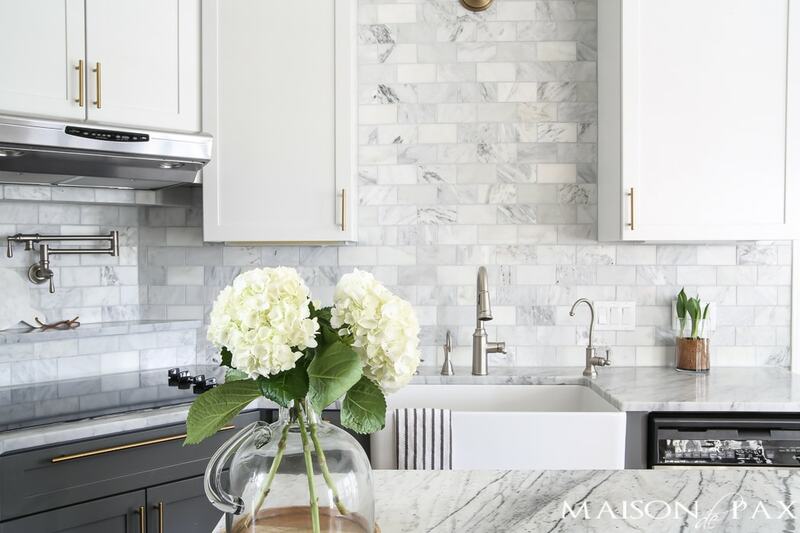 I’m so glad you like the kitchen, and I hope you love marble, too! The taller faucet over to the right is the filtered cold water tap. The shorter faucet between the big faucet and the soap pump is a hot water tap that was in the kitchen prior to our renovation. We saved it because it was in great shape and we loved it so much! I think it’s made by insinkerator. I hope this helps! Beautiful kitchen! my current kitchen looks like your former kitchen. I could paint my arched doors professionally (very expensive but an old look), but I am looking to replace my cabinet doors with factory painted shaker doors for a bit more just as you said. How did you get the paint finish on the wood boxes and frames to match the factory painted doors? I am being told the finish between the painted bodies and new manufactured doors would be very noticeable and different. Thanks! LOVE YOUR KITCHEN!!! Great question! My painters simply took the new doors to Sherwin Williams to have them color matched. We did a second try on the gray (it seemed a touch too light the first time), but by the second try, they were basically perfect. Sometimes in certain lights I can see a slightly different sheen between them, but otherwise I really can’t tell any difference. I hope this helps!